Homemaker of Settle was established in the picturesque Yorkshire Dales market town of Settle in 1993. 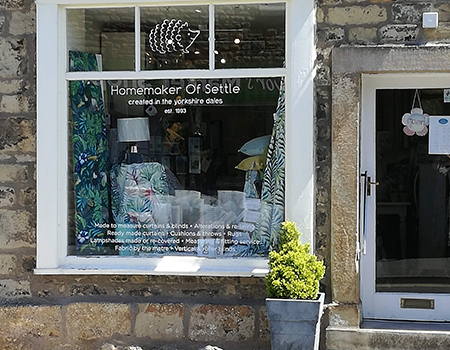 Over the last 25 years this independent shop has become a main stay for both local and tourist customers, shopping for good quality home furnishings such as curtains, blinds, throws, lampshades and cushions. All our fabrics and products are carefully sourced from established UK and European suppliers which has enhanced our reputation. Our online shop features many of the items available in the Settle shop: readymade curtains, cushions and throws, curtain poles and tracks, rugs, door mats and runners. It also has towels and bedding not currently available in the Settle shop. We are hoping that by exploring our online shop, it will inspire you to come and visit us in the beautiful Yorkshire Dales. Whether visiting our shop in person or shopping from the comfort of your own home online, there is something to appeal and suit all budgets.